Author Bill Bohannon’s Newly Released “Reflections from the Journey” Is The Fascinating Account Of The Highs And Lows Experienced Throughout The Author’s Life. 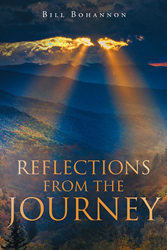 “Reflections from the Journey” from Christian Faith Publishing author Bill Bohannon is an account of the author’s journey through highs and lows. Staying positive, and having faith in the Lord, one can look back on the journey with joy and contentment. “Reflections from the Journey”: a captivating account of the author’s life through highs and lows, but always focusing on the positive. “Reflections from the Journey” is the creation of published author, Bill Bohannon, a singer-guitarist who has worked in radio, television and the film industry. Published by Christian Faith Publishing, Bill Bohannon’s new book is the captivating account of the author’s life, starting as a shy child and dreaming of being a star. Bill Bohannon started from modest beginnings and dreamed of becoming a success. Determined to achieve success, Bill learned to play the guitar and sing. Hard work paid off and Bill became an entertainer, working in the film and broadcasting industries. In this fascinating book, Bill Bohannon shares the highs and lows experienced throughout the journey. Looking back at the special moments in life, one may think about the mistakes made, but the good decisions always led to positive outcomes. It is the author’s sincere hope that readers can relate to some of the experiences in the journey and remain positive, in all situations. View a synopsis of “Reflections from the Journey” on YouTube. Consumers can purchase“Reflections from the Journey” at traditional brick & mortar bookstores, or online at Amazon.com, Apple iTunes store, Kobo or Barnes and Noble. For additional information or inquiries about “Reflections from the Journey”, contact the Christian Faith Publishing media department at 866-554-0919.